to give my honest opinion in exchange to review the product. I love the color and style of the backpack. Sure is your son loved it too! That's a very cute back pack. My daughter also have a customized bag from Posy Lane but it's a duffel bag which is great for a teen. I love it! What a cute personalized bag. Wish my kids will have one too. Wow! you got a bag, too. Posy lane is such super sweet. Isn't it? I love your backpack choice for your kid. 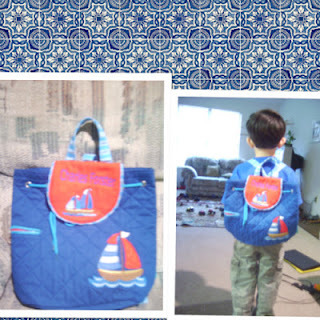 The boat design is perfect for boys like him. I love the different designs that you can choose from posylane!